Is it just me? I seem to enjoy deviled eggs more during the spring than any time of the year. Maybe that's because I tend to only make them now. That needs to change because they are addicting - especially these! 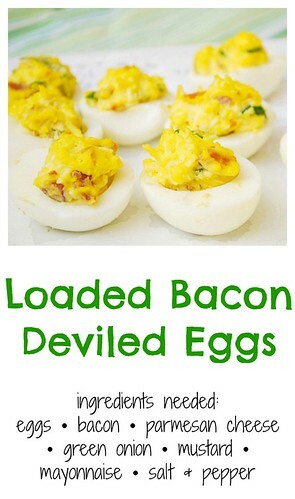 This recipe is kind of a play on breakfast because the addition of bacon just makes so much sense. How can bacon and eggs not go well together? Another bonus about this recipe is that there is very little moisture added to the filling. 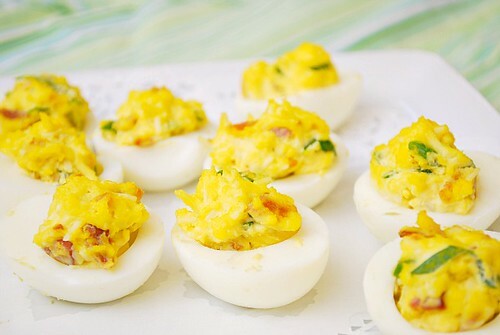 Nothing is worse than a runny or soupy deviled egg filling. 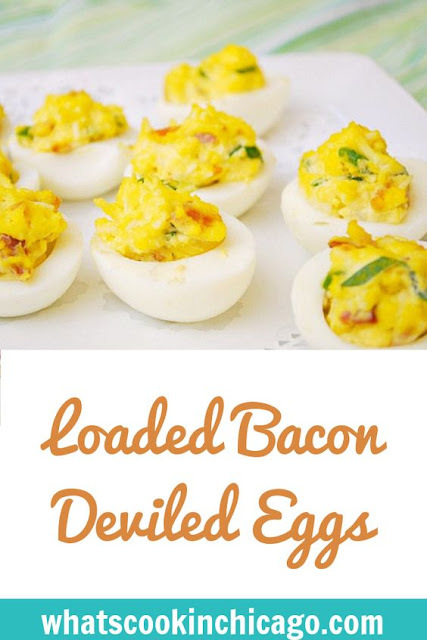 The filling in this recipe is nice and firm, holds its shape and has good texture from the bacon, cheese and green onions mixed in. Next time, I'll need to make at least double this because I couldn't keep them on the serving platter long enough! Cut eggs in halves lengthwise and remove yolks, placing yolks in a medium bowl. To the yolks, add the remaining ingredients and stir to combine. Carefully fill the hollowed out egg whites with the yolk mixture. Cover and refrigerate for at least 1-2 hours to meld flavors. Ohhh Yum.. I ove the addition of the cheese!